Some one on another forum asked about towing the K1600 so I posted this info. When using "New" straps check them after about 50 miles as they can stretch some at first. 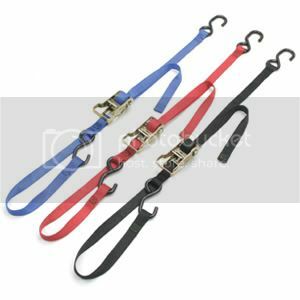 If towing long distance check the straps at every stop (gas, food etc). 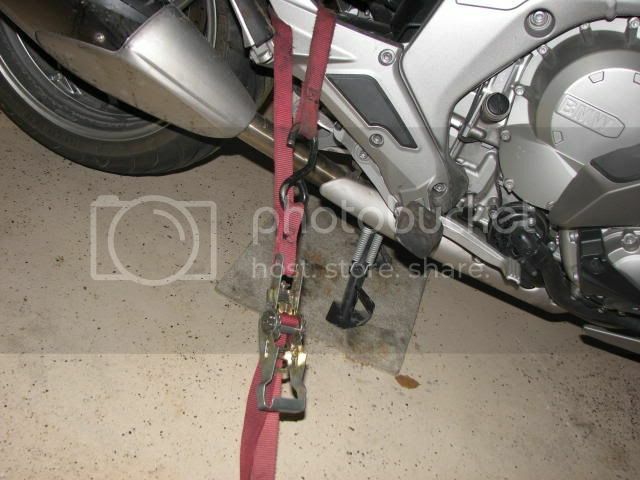 When using a chock always tie the bike "Forward" into the chock. I ALWAYS use "Soft tie straps" By Ancra. I get them online. On the rear go around the "Square tubing behind the rear foot peg. Pull that strap to the front also. Last edited by katnapinn; Apr 5th, 2012 at 3:40 pm. The photos above clearly illustrate use of the tiedown points shown in the owners manual and work well. It's a good idea to place soft toweling between the straps and the frame to prevent marking the frame, especially if towing for long distance. 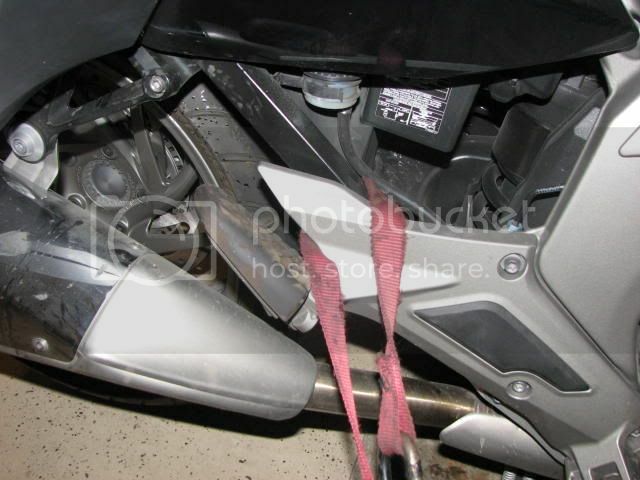 For safety, the sidestand and center stand should not be deployed during towing. Those are two of the weakest points to tie down a bike. The Engine guards are made to take the force of a drop pushing the guard INTO the engine. NOT pulling down on the guard. That can pull a bolt from the motor. The foot peg support is cast aluminum & can brake from the force of the bike bouncing up & down. Believe me I've towed over 2000 bikes in the last 3 years with only 1 incident & that was a bad strap that let go. Raffey used to sell these: Baxeley Wheel Chock. Makes towing a bike so much easier. Wow that bike looks dirty and lots of bugs. The first step before tying down would include a through wash job. I can't imagine any other way. Just kidding guys, any one who knows me would understand . Hey !! I use those bugs for both a Science & Math project for my Grand kids. The have to tell me what kind of bug it is & how fast I was going when I hit it. My wife and I go camping with a toy hauler. We will sometimes take our bike with us. I don't like using the side stand, but the floor in the toy hauler allows the bike to move during towing, no matter how tight the tie down straps are. So, I have resorted to tying the bike down with the side stand down. I try and keep the pressure off the side stand, but now the bike can move without the fear of it sliding and falling over. We are about to go to Tucson with the bike in the trailer. This is a bad time of year to try and ride out of and back into the Salt Lake corridor. Had to call Roadside Assistance to have my GTL towed on a flatbed. The driver knew what he was doing, did soft ties at the factory-specified locations with rags underneath to protect the finish and used a front-wheel chock. The interesting thing he did was take a tie around the rear wheel. Started at one side, went over the rim, under the tire, then over the rim again to the other side, then cinched it down. His explanation was that it would keep the rear wheel from sliding side to side. So: chock in front, rear wheel secure laterally, and straps keeping it from moving fore and aft. No need to put the sidestand down and risk damaging it (or worse) by having the bike bouncing against it. It is nice when you get a driver who knows what he is doing. I've seen so many bikes damaged by "Buba" on a flatbed because he did not have a clue how to strap the bike down. Worked a car vs motorcycle once where the wrecker driver used an old dual strap sling and slid it under the bike, then just hooked the bar with the cable and let the bike flop around as needed. Ouch. ALWAYS use 4 straps on the bike. When I first started towing bikes the manufacturer of the trailer I use said "Only 2 straps are needed to hold the bike" so that is what I did till 1 strap failed & it cost me $2000 to fix the bike. That was the one and only time I have had any bike damage. I always use 4 straps now. 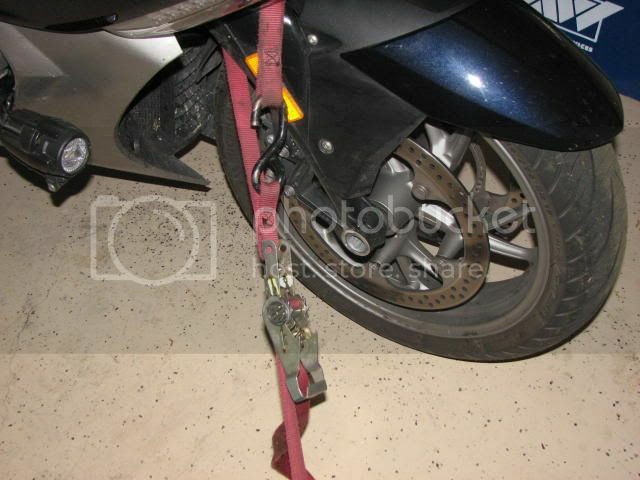 Get a wheel Chock & strap the bike like the pictures in this thread. You will never have any trouble. Also remember to check the straps at every stop & if the bike is left strapped over night check them before moving as they will get loose. What about traveling on a ferry. No front wheel chuck there. And the deck is made of steel. Will the 4 strap work. Yes, worked fine when I went to Newfoundland last summer. Just don't have the straps perpendicular to the bike. Pick anchors in front of and behind the bike if possible. This keeps the bike from rolling back and forth. Next best is to use a single deck anchor midship the bike. The straps should be such that they are putting the bike in tension as in the first case, or compression as in the second case. A top town view of the straps should look like an "X" in the first (ideal) case or a diamond in the second case. If they look like an "H" from the top, that is bad. You can see this somewhat in the attached picture. 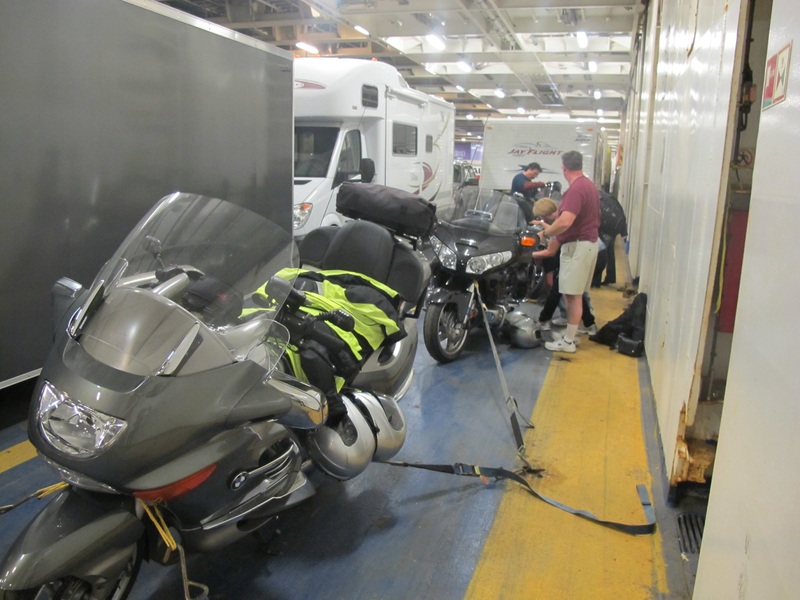 Yes, I ride an LT not a GTL, and, no, I don't ride in shorts, but they are nice under the riding pants so I can be comfortable in the rather warm bowels of the ferry. Looks like your bike is on its side stand correct? Yes, I wanted the suspension to be able to work, but boats really don't move that hard unless they crash into the dock. I tightened the side stand side straps barely snug, then ratcheted the opposite side to compress the suspension and largely unload the side stand. Worked fine for both of the 6 hour boat rides. Thanks for the answer and picture. I am also riding a LT. But was looking maybe trading to the GTL. In the picture it looks like the rear straps are attached to the passenger foot rests. 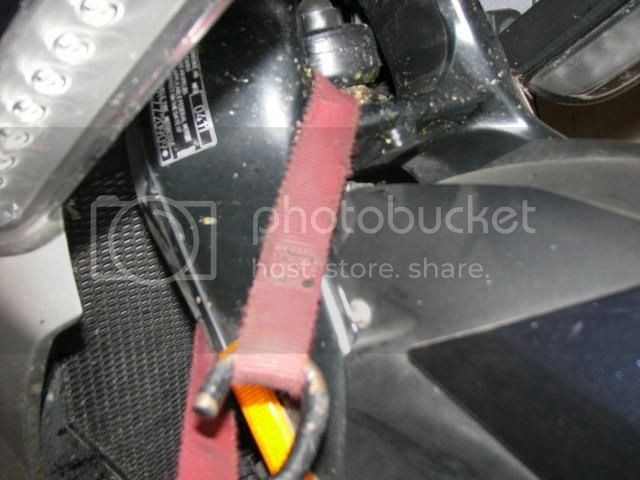 There is a PDF file that I got from this site that shows attaching the rear up under the saddle bags. The frame under the saddlebags is a better location, but I had a hard time getting the sizeable straps the ferry provided into that location. The rear pegs were much easier to use and plenty strong for a boat ride where you don't have the bouncing and jarring of a road trailer. Probably a good idea to carry your own short straps for forks and rear frame, but I didn't have any and storage space is at a premium for two on an LT for a three week trip. Thanks, I may try and carry my own straps as I am taking the same ferry over last week in Jul and back a week later. If you ever need to do a tow, it is only $25 to rent a trailer from U-Haul, but don't rent the $15 motorcycle one because it is too short for the K16. Open hooks make me nervous. I use straps with carabiner hooks. Carabiner hooks are a good idea, but I'd stay far away from the Canyon Dancer for most any BMW. Those are meant for sport bikes with very short handlebars, or dirt bikes that don't weigh much and usually have a crossbar brace on the handlebars. A big BMW like the LT or K16 is just too heavy, with long tiller handlebars, making it quite easy to overtorque and bend the bars, possibly even letting the bike loosen up and fall over during transport. Even the lighter K12/13GT with shorter handlebars uses a simple metal pipe for the grip end which can bend quite easily if direct force is applied. I've never had any issues securing any of those bikes by tying down just above the front fender and low on the rear subframe near the passenger pegs. That has worked well for thousands of miles of towing under all conditions on several different Beemers.